On Wednesday, I tidied my daughter’s room because we are getting the house refinanced and the appraisers were coming on Thursday morning. The room wasn’t too much of a mess, but she does tend to leave shopping bags and other stuff on the floor when she visits from Cleveland because she’s often in a rush. 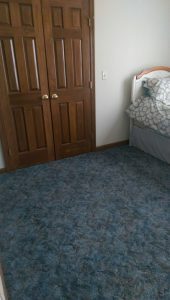 The room looked much neater with the bags in the closet and the carpet vacuumed. Because our existing mortgage dates back to before the recession, we’d have done better to refinance before now, so as to get more benefit from today’s low interest rates. But when the house was full of clutter a few years ago, we didn’t feel as motivated to get things done generally. There was so much that needed our attention, it left us feeling overwhelmed. Now everything feels like it’s going much more smoothly—not just a better-organized house, but tidy finances too! My daughter just cleaned her room thoroughly and she was like WOW, it really does make a difference. LOL! Glad your finances are working out nicely! Yes, and it’s not just kids who don’t notice that cleaning things up would make a difference — all too easy for grown-ups not to notice, too! Yay! Tidiness truly does work wonders! One of my greatest motivators for getting tidy is all the unexpected miracles that result when we create more space & clarity in our lives. Indeed — it’s much easier to notice what’s going on around us when we don’t have stuff in the way!